This thread is simple! Rather than having a million little threads about everything that goes on at Walt Disney World's Disney's Hollywood Studios, this thread is designed to consolidate it all into one user-friendly thread. Feel free to use it to post updates, trip reports, questions, comments, and of course, general discussion. For pictures and videos of the park as well as past updates, see TPR's Park Index Page. August 9th, 2007 - Disney/MGM Studios to be renamed Disney's Hollywood Studios; Toy Story Mania, Block Party Bash & more coming in 2008! February 8th, 2008 - American Idol theater concept art posted! September 12th, 2009 - Star Tours: The Adventures Continue officially announced! February 2nd, 2011 - George Lucas visits Star Tours to give the ride a test run! April 1st, 2011 - Star Tours destinations revealed! June 22nd, 2011 - Disney pulls the plug on ESPN the Weekend! December 8th, 2011 - Osbourne Spectacle of Dancing Lights photos posted! December 9th, 2011 - Comedy Warehouse returns for the holidays at DHS! December 13th, 2011 - Quick photo update from the park! December 23rd, 2011 - Star Tours Mainstreet Electrical Parade tribute found! December 28th, 2011 - Comedy Warehouse Holiday Special photo report posted! January 21st, 2012 - Rock the Night special fireworks show coverage! April 8th, 2012 - Star Wars Weekends 2012 Celebrity Details Revealed! November 29th, 2012 - Comedy Warehouse Holiday Special set to return! December 20th, 2012 - New stories coming to Disney Junior: Live on Stage! April 26th, 2013 - "May the Fourth" Star Wars Celebration announced! April 26th, 2013 - Monsters University Meet & Greet location announced! October 7th, 2013 - Glow with the Show ears coming to Fantasmic! October 30th, 2013 - The Hollywood Brown Derby Lounge now open! March 18th, 2014 - Do You Want to Draw a Snow Man? Learn to draw Olaf! June 9th, 2014 - Guardians of the Galaxy preview debuts July 4th! June 26th, 2014 - Frozen Summer Fun Live announced for Summer 2014! July 5th, 2014 - Frozen Summer Fun Event - Full photo & video report! September 12th, 2014 - Frozen Summer Fun elements get extended run! November 8th, 2014 - Big Hero 6 Meet and Greet Now Open! November 25th, 2014 - Great Movie Ride to get TCM-inspired updates in 2015! March 18th, 2015 - Toy Story Midway Mania adding more track! May 16th, 2015 - Star Wars Weekends 2015! June 18th, 2015 - Frozen Summer Fun photo report posted! June 23rd, 2015 - The Great Movie Ride enhancements confirmed! January 15th, 2016 - Lights, Motors, Action! 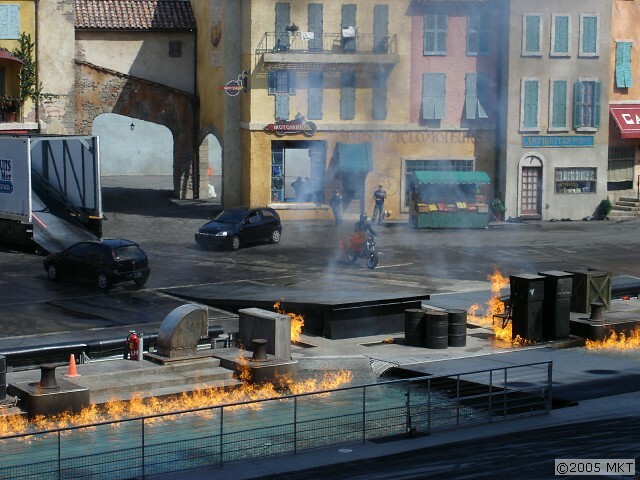 stunt show closes April 2nd! July 11th, 2016 - New Star Wars Land concept art released! November 22nd, 2016 - New nighttime Star Wars Land concept art released! November 6th, 2017 - Flurry of Fun Christmas Event Media Night! February 12th, 2018 - Preview new toys coming to Star Wars - Galaxy's Edge! February 12th, 2018 - Mickey & Minnie's Runaway Railway to open in 2019! February 12th, 2018 - New Star Wars-inspired resort details released! February 16th, 2018 - Toy Story Land officially opens on June 30th, 2018! February 22nd, 2018 - New Star Wars-inspired resort visuals released! February 22nd, 2018 - New Toy Story Land preview photos & video! June 28th, 2018 - Slinky Dog Dash Complete POV! January 17th, 2019 - Lightning McQueen's Racing Academy opening date revealed! Last edited by robbalvey on Thu Apr 04, 2019 11:17 am. I honestly have never been a big fan of stunt shows... This looks kinda cool but they always seem a bit lame. I just kinda never know what to think of these things as usually most of the things going on just aren't close enough to you to make a real impact. kenshinmac wrote: This looks kinda cool but they always seem a bit lame. Anything with fire will get me in the door Plus -- stunt cars? That seems so difficult (I saw them practice at Epcot's parking area -- and what they did was pretty wicked). I'm looking forward to it. Sorry you miss the houses. Never saw that. Last edited by Jose Eber on Thu Mar 17, 2005 10:40 pm. I hate shows. Never liked them. If I see one show a year, that's a lot for me. I *LOVED* this show when we saw it in Paris. 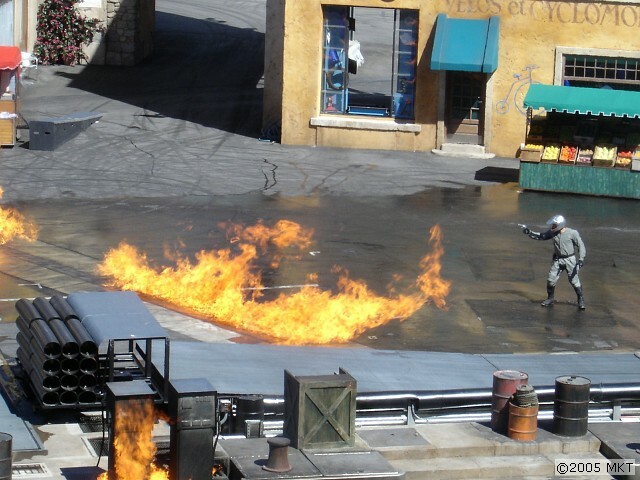 I have never enjoyed a stunt show before and was especially disappointed when the plane didn't launch when I went to see Waterworld at Universal Hollywood. All the shows I have seen were terrible. Worst was a Batman show at Six Flags Over Texas... 30 min late because of technical difficulties in high 90's and it was just complete and utter crap. ^ Yeah, take the Waterworld show, give it Disney quality and a budget that seems to be 10x that show and that's what this is. IMO, a show is only 'good' unless there is a lot of action, a lot of fire and stuff blows up. This show gives me all that! What you mean good narration? None of the terribly acted bits between something that could be considered remotely action oriented. Seriously though Waterworld had some cool parts. The bit where they launch the jetski under the wall and some of the explosions were cool. Overall though it was pretty painful. 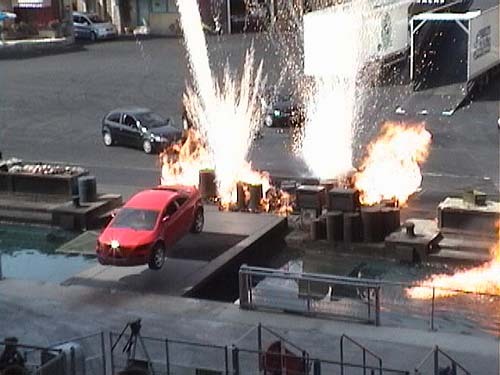 The worst thing was that Batman show I was talking about at SF:OT was setup as like a stunt shoot. So they keep pausing and saying now we are going to film such and such. OMG it was terrible you saw the stunt men bouncing on trampolines and stuff on some of the falls. Ack!!! Six Flags shouldn't be allowed to do stuntshows. Honestly why hasn't anyone made a tongue in cheek stuntshow? I mean seriously make fun of the bad acting and stuff. Joke around with the audience. It could be incredibly funny if they got the right people. Here's a shot from the show in Paris. Looks nearly identical. Wow, great pictures. 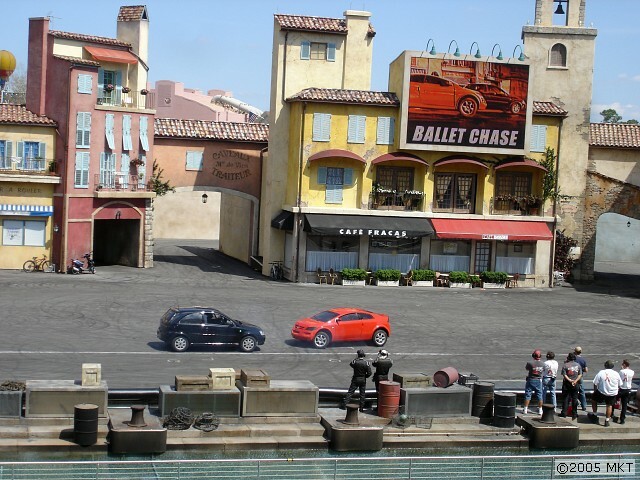 I saw this show a few times before in Disneyland Paris and yes, it looks definitely like the same in DLRP. I like this show, because there are a lot of cool stunts and action. I think it is a good expansion for the MGM Studios. --> from good old Germany and back in Orlando!